I’ve been on a ceviche kick lately. It’s the perfect appetizer…satisfying, yet light. And it perfectly suits my way of cooking…invent as you go. Every weekend I’ve been picking up some type of fish (sustainable only) and experimenting with different ceviche flavor profiles. Eventually I plan to go around the word with my ceviche experiments, so stay tuned. As for this inaugural effort, I’m not sure where it hails from, exactly. But I know where it’s going: Smack dab in the middle of my Thanksgiving appetizer table. Serve with light crackers (like Mary’s gluten free or rice crackers), or homemade tortilla chips. If you’re part of the 99% and you’re feeding a crowd, you might want to sub out a less expensive firm, sustainable fish of your choice. I’m thinking tilapia, local rockfish, wild sockeye, or mackerel. Measurements are exceedingly inexact. Eyeball it, play and taste as you go. Scale up (tee hee) as you wish. Put the tuna in a medium bowl. Add the lime juice and toss to coat. The fish should be well covered but not swimming in lime. If you need more to thoroughly soak the fish, add it. Add the remaining ingredients by eye and toss. Let sit 10 to 15 minutes, tossing occasionally to mix well. Taste and correct seasonings. Serve immediately or refrigerate and serve within 6 hours. 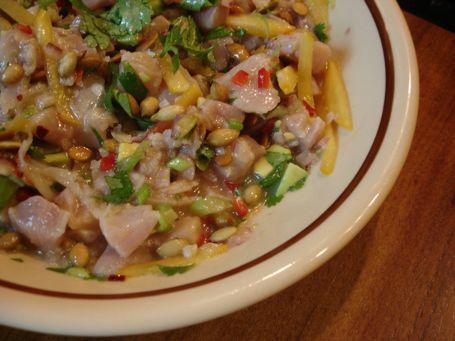 This entry was posted in Food and Drink, Latin American, entertaining, food sustainability, healthy, holidays, seafood and tagged albacore ceviche, albacore recipes, ceviche, gluten free, recipes using albacore, sustainable seafood ceviche. Bookmark the permalink. Post a comment or leave a trackback: Trackback URL.